After watching Victoria Azarenka take out one of the best players in the world, Caroline Wozniacki, 6-4 6-2 in the 2nd round of the 2015 Australian Open, you might ask why I would still wonder if she is back. The reason is quite simple. Her shotmaking is back (love that backhand down the line a la Simona Halep), but part of being fully back to being the player she once was is her level of fitness and consistency. Will she maintain her shot technique and discipline or will it break down unexpectedly…maybe against a player she should beat easily…over the next match or two? And if her technique is sound, can she roll through 7 matches to capture her 3rd Australian Open championship? I can’t wait to see. Because if she can do those things, she goes from being an unseeded player few were talking about a week ago to a top favorite to win it all. I was very impressed with Petra Kvitova’s 6-2 6-4 win versus Mona Barthel. The scoreline looks like a routine victory for the 2-time Wimbledon champion, but there was one game in the second set that really showed me something from Petra. After a fairly easy first set, Petra found herself in a nearly 15 minute single game serving at 2-3 in the second. The marathon game would go to 9 deuces, with Kvitova having to fight off multiple break points. She did so often with some spectacular running shots that I am not sure she would have hit a year ago. Her fitness is vastly improved. What’s more, as a long time Petra fan, this was exactly the kind of match where she would end up with a head-scratching loss…cruising along, then gets broken out of nowhere and falls apart. That didn’t happen here because she wouldn’t let it happen. I was extremely pleased to see this from her. The only sad part is that next up for her is Madison Keys, a possible future top favorite for me. It’s always a joy and a bummer to see two of my faves play each other. I like watching them play, but unfortunately somebody has to lose. Eugenie Bouchard moved past Twirlgate to keep rolling along down under at the 2015 Australian Open. After being pushed early by the very capable Caroline Garcia, Genie found her way and finished with a flourish, 7-5 6-0. Bouchard’s big 2014 began in Melbourne as she was the only player to reach at least the semifinals in all of the first three Majors of the year. She has looked pretty good so far in 2015. 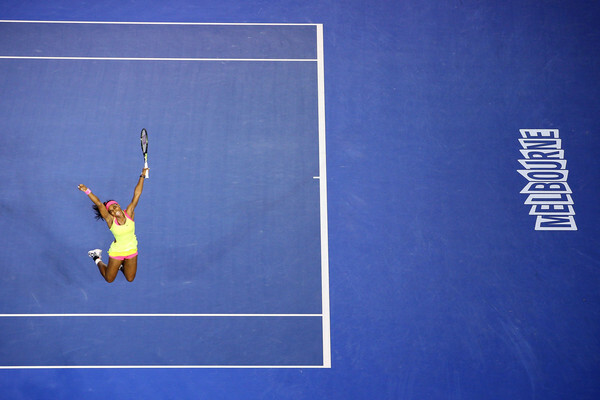 She even had a win over Serena Williams at Hopman Cup. Of course, that doesn’t count towards WTA rankings but it definitely appears as though her end of year struggles were left behind in 2014. If she gets by Irina-Camelia Begu and Maria Sharapova gets by Peng Shuai, we would have a marquee quarterfinal in Masha vs Genie. But neither can allow themselves to look past their fourth round opponents. Speaking of Masha, she found herself in dire straits against Alexandra Panova in round 2. Round 3, not so much. She was back to being Masha the Great, rolling through 31st seed Zarina Diyas, 6-1 6-1. After what she went through in her previous match, it was good for Sharapova to get a quick double breadstick victory. She’ll need to keep her level of play high taking on the 21st seed Peng Shuai, who reached the semifinals of the 2014 US Open before succumbing to Caroline Wozniacki and heat exhaustion. But it showed she can have success on hard courts (although these are different hard courts). Masha cannot get caught looking ahead to a possible Genie Bouchard match-up in the quarters. 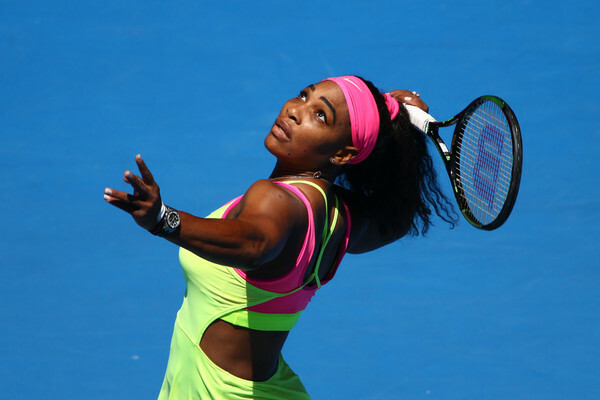 There will be four American women advancing to the fourth round of the 2015 Australian Open. Two of them are named Williams, which should surprise nobody. However, the other two are named Madison. I’ve been banging the drum for Madison Keys ever since I saw her at the 2011 US Open as a 16-year old bursting with talent, armed with an unteachable bazooka serve. Last year, she broke through for her first WTA singles title at the 2014 Aegon International. She hasn’t won the the title here…yet…but beating #4 Petra Kvitova might be just as significant a win as the Aegon final. Petra is one of the very best on tour, a 2-time and reigning Wimbledon champion who was playing well down under. To take her out 6-4 7-5 is very impressive, especially considering the growing maturity in her game. When I’ve watched Madison before, she has had the big serve and big ground strokes, but lacked patience in building points. She often would try to paint a line too early in a rally. Against Petra, she worked the point and waited for the right moment to pull the trigger on a big shot. She hits so hard that she doesn’t need to always try to go for small margins. Hit the ball crosscourt over the lowest point in the net and make the opponent play. 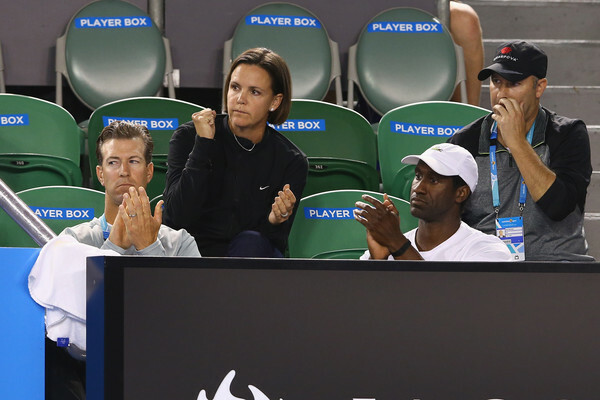 Madison brought on Hall of Fame superstar Lindsay Davenport as a coach. It definitely looks like Lindsay is shaping Madison’s raw talent into wise tactics. I think it’s a perfect player-coach fit. Even before they joined forces, Madison’s game reminded me of Lindsay’s. 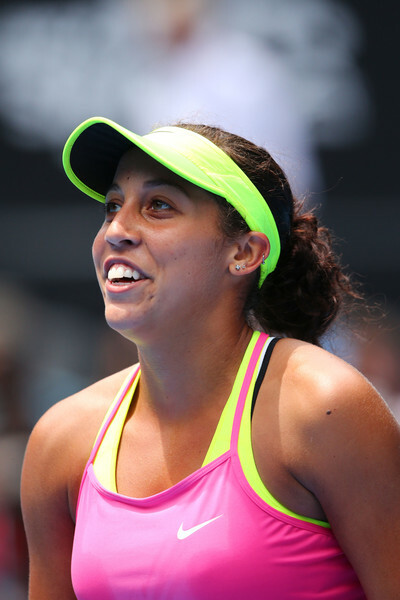 The result so far is Madison Keys in her first ever fourth round and second week of a Major. It will be an all-American, all-Madison fourth round match as Keys will face Madison Brengle. It has been a tremendous start of the year for Madison Brengle. The 24-year old Brengle was a surprise finalist at the Hobart International. Although Heather Watson would take the crown there, it was a possible announcement of a rising American star. Sure, Brengle was a finalist at the 2007 Australian Open in the junior division, but that was a long time ago (in tennis years) and it was juniors. So I wanted to see how Brengle would follow up the Hobart final. Would she keep playing well or fade back into the field. So far, she has maintained that high level. She started her run in Melbourne by upsetting the #13 seed, Andrea Petkovic. She followed that up by besting two fellow Americans, Irina Falconi and Coco Vandeweghe. I am actually a bit miffed that there have been so many American vs American matches. Coco has been playing very well, worthy of still being in the tournament. And now the Madison vs Madison fourth round match will eliminate another American. But that’s the luck of the draw. I should be happy so many Americans are still around to play each other. 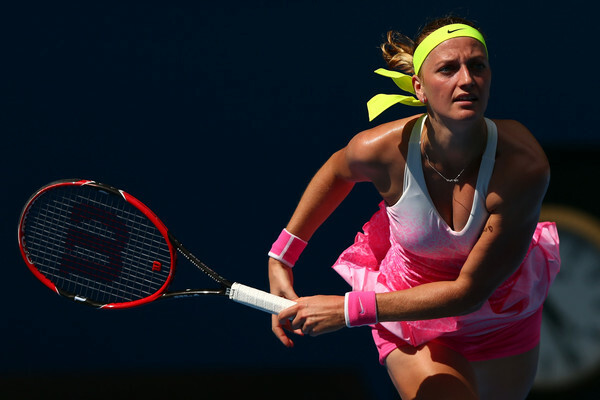 By seeding, this fourth round match was supposed to be #4 Kvitova vs #13 Petkovic. Petra is one of my top two c0-favorites, along with Simona Halep, but I have also said that is dependent on the progress that Madison Keys makes. Although Petra lost much earlier than I would like, I was not at all sad to see Keys win. I might have to go with three co-favorite players. Getting back to Madison Brengle, it’s also just great to see her out there playing after having a cancerous spot in her knee removed last year. She also had a mass in her jaw but that luckily proved to be benign. The doctors cleared her to come to Australia just a few weeks before Brisbane. There was a chance she wouldn’t even be here playing. The most important thing is for her to have a long and healthy life. I just wish that for her. Anything tennis-wise beyond that is a bonus and a blessing. Last year, Maria Sharapova vs Simona Halep in the Roland Garros final was voted best match in a Major (although I think it should have been Petra Kvitova vs Venus Williams at Wimbledon). At any rate, the Sharapova v Halep Roland Garros match kind of overshadowed what might have been the best match of that tournament prior to the final, Masha’s three set survival against Eugenie Bouchard in the semifinals. It was a tremendous effort by Sharapova after dropping the first set and being pushed to the brink in the second set. Masha won the third set handily (score 4-6 7-5 6-2) but make no mistake, Genie validated her run to last year’s Australian Open semis as no fluke, which she would further validate by reaching the Wimbledon final. What’s more, Bouchard showed she was not afraid of Sharapova and had the game to compete with her. Genie will get another crack at Masha after a tougher than expected 6-1 5-7 6-2 win over Irina-Camelia Begu. Genie was rolling along until kind of losing her way a little in the second set. But she finished in fine form. She will need to maintain a high level against Sharapova. Since being taken to two match points against her by Alexandra Panova, Masha has been razor sharp. She’s won her next two matches, giving up only 5 total games combined. The way she blew through the dangerous Peng Shuai 6-3 6-0 was very impressive. If there is a weakness that Genie can exploit, it’s Masha’s second serve. Bouchard is a very aggressive returner. If she can make Sharapova pay for missing first serves then she can pull the upset. Also, if she can make the former world #1 move, which is also not her strength, Genie can cause her problems. If Bouchard can’t do those things, it’s going to be tough to derail Masha. Meanwhile, the player I hope wins it all (well, her or Madison Keys) kept rolling along. Simona Halep had a very tricky match-up with Yanina Wickmayer. Wickmayer is the kind of player that can unexpectedly jump up and bite a higher ranked player and pull an upset. But not on this day. 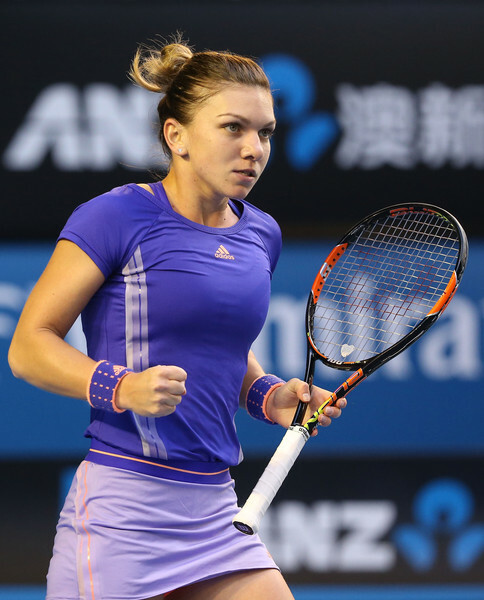 Simona reached her second straight Australian Open quarterfinal with a 6-4 6-2 victory. If she can continue to serve the way she did against Yanina, Halepeno might just hold the trophy next weekend. On the other hand, she is going to get her biggest test of the tournament, maybe of her year to date, in #10 seed Ekaterina Makarova. In the past, Kate has upset Serena Williams in Melbourne so she won’t have any fear of Simona. Although Simona is the higher seed and leads 1-0 H2H, this is a pick ‘em match. When Madison Keys was 4 years old, she saw Venus Williams playing at Wimbledon and wanted to play tennis in part because she liked the dress Venus was wearing. 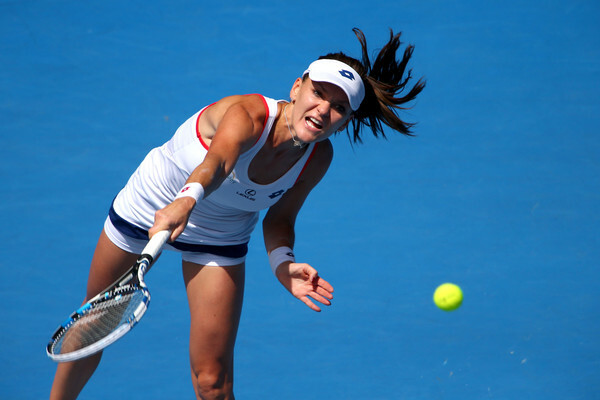 15 years later Madison was dressed for success as she advanced to her first ever Major quarterfinal at the 2015 Australian Open. Save for a few shaky games in the second set, Keys was in control throughout her Battle of the Madisons fourth round match against fellow American rising star Madison Brengle. Keys’ serve and big ground strokes were just too much for the overpowered Brengle. And now, a month away from her 20th birthday, the 4-year old little girl who loved Venus’ tennis dress is all grown up and ready to take on Williams in the quarterfinals. 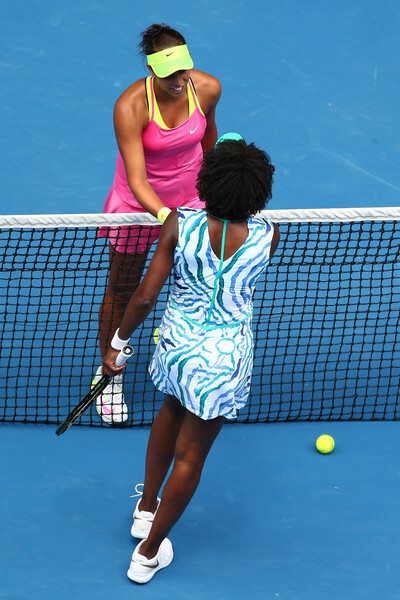 But hopefully, Madison Keys will not have too much respect for Venus going into the match. Healthy respect, yes. However, it’s winner take all for a spot in the semifinals of a Major. Venus is the opponent. Madison needs to go in with the thought and belief that she can go through Williams to advance one step closer to her own history making title. She needs to have the same attitude that Eugenie Bouchard has, win or lose, when she takes on her tennis idol, Maria Sharapova. Madison has the serve. She has the ground strokes. Does she have the maturity in her game and stillness in her nerves to defeat a future Hall of Famer? When Maria Sharapova played Alexandra Panova in the 2nd round of the 2015 Australian Open, the former world #1 looked like anything but a contender for the title. She struggled through two sets and faced a pair of match points against her. But Masha is a fighter. She fought off those match points and since escaping the upset has played like a champion. Over the past three rounds Sharapova has been the best woman in the draw. She took a much-hyped showdown with 7th seed Eugenie Bouchard and turned it into a routine 6-3 6-2 lesson in power tennis. Masha was in control from the first game and never let up. 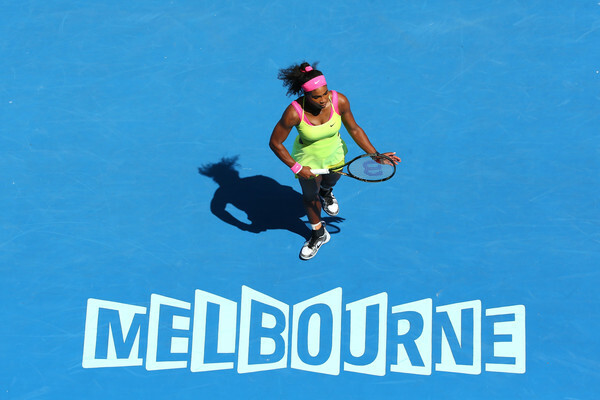 The 2008 Australian Open champion reaches her 7th semifinal in Melbourne, where she will face fellow Russian Ekaterina Makarova. The 10th seeded Makarova blew through 3rd seed Simona Halep, 6-4 6-0. The first set score appears tight, but it really wasn’t that close. I was quite disappointed with Simona’s effort, to be honest. Winning and losing happens. Sometimes the opponent is just better on a given day, as Kate was on this day. But it kind of seemed like Halep didn’t have much fight in her. Even when Serena Williams is rolling through Sharapova at times, Masha never stops going for it and fighting to the last point. Simona says she felt “stressed” once the match started. In the end, Kate deserved the victory. She pushed Halep around with big ground strokes and let’s face it, Makarova is underrated. This is her 2nd straight Major semifinal. She is a player on the rise. Sharapova has not lost to a fellow Russian player in a Major in over five years. Can Kate break that streak? 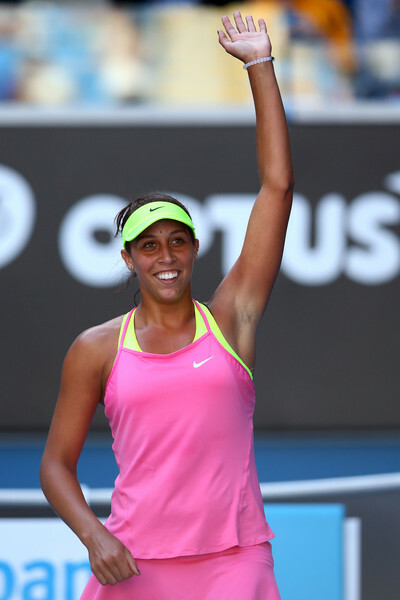 I learned a lot about Madison Keys on day 10 of the 2015 Australian Open. I’ve known she’s bursting with talent for a few years now. But what about when she had an injury plus a dangerous opponent in front of her? Would she be able to gut it out? The answer is an emphatic yes! Understand me, if she is injured to the point she has to retire, as she was at Wimbledon 2014 in the third round against Yaroslava Shvedova, there’s nothing to be done about that. But against Venus Williams, in Madison’s first ever Major quarterfinal, that same leg injury (left adductor) flared up again. It wasn’t as bad physically as at Wimbledon, but the mental challenge was even greater. Suddenly, after out-hitting Venus and winning the first set 6-3, Keys fell behind two breaks at 1-4 and had to leave the court to get her leg wrapped. She admitted afterwards it was like the nightmare coming back. It looked like the beginning of the end for Madison down under. 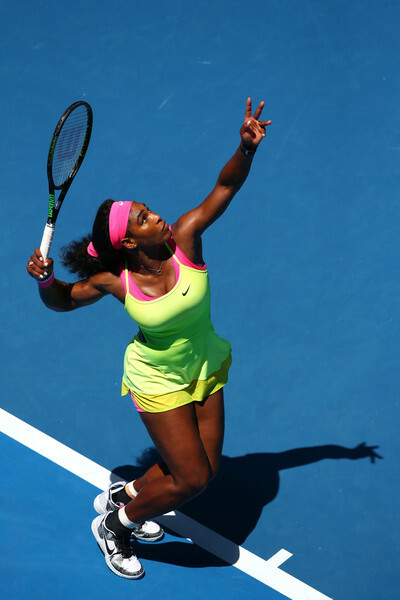 But she returned to the court, erased both breaks and tied it up at 4-4. However, she was clearly bothered by the injury, trying to shorten points with big shots. Sometimes they went in. Sometimes they didn’t. It became a little sloppy on both sides of the net. Venus tried to move Madison around, but the teenager didn’t cave, even when she lost the second set and twice fell behind a break in the third. This is where Madison showed why so many tennis aficionados are proclaiming her the next big star in American tennis and one of the next big stars overall, along with players like Canada’s Eugenie Bouchard and Romania’s Simona Halep. Keys broke Venus twice to get back on serve, and then a third time at love to win the match, 6-3 4-6 6-4. 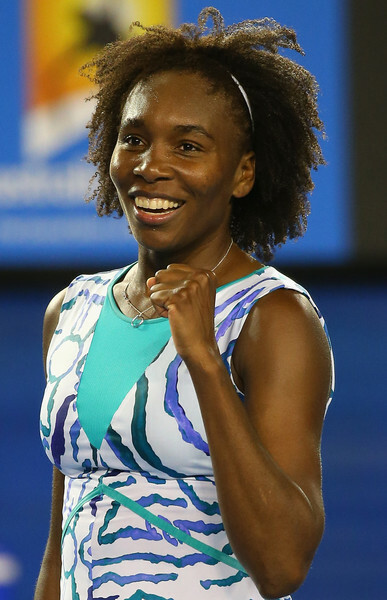 Against one of the biggest hitters in tennis history, Keys hit 34 winners to Venus’ 10. It only gets tougher from here as Madison goes from one Williams sister to the other. Serena walked through Dominika Cibulkova 6-2 6-2. It really wasn’t even that close. I am pulling for Keys, but I’d be lying if I said she was a favorite to upset Serena, especially with a wrapped left adductor and having to come back with no day off. But if Madison is healthy enough in the semifinals, she has the serve and big ground strokes to make a better fight of it than Domi. However, Madison’s health status is a very big if. So the final will be USA vs Russia. A toss up, but I will go with the best: SERENA. We'll see...gotta get past Masha...on paper, that seems like no problem. 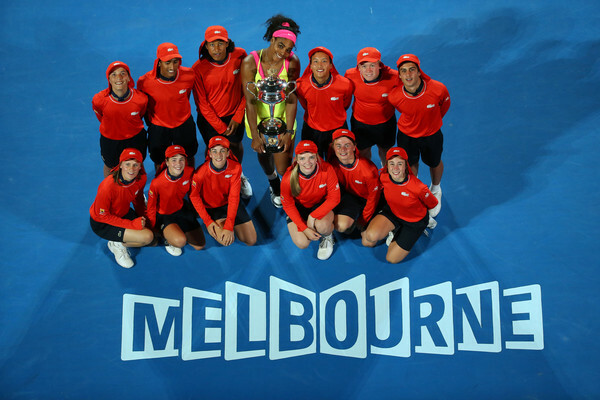 more pics and video on my blog: 2015 Australian Open Day 11: Maria Sharapova Advances To Final, But Can She Overcome Serena? In the end, I suppose this is the one people want to see. #1 vs #2. Serena Williams vs Maria Sharapova. The 2015 Australian Open women’s singles final will feature arguably the two highest profile female athletes in the world. Sharapova started off the semifinals by maintaining her perfect record (6-0) against Ekaterina Makarova. Serena followed by ending the Cinderella (for now) run of Madison Keys. I say “for now” because a case can be made that Madison has arrived at the upper echelon in women’s tennis and should no longer be a surprise deep in a tournament. But the very top of the mountain still belongs to Serena. She has a 16-2 record against Masha, which includes a still active streak of never losing to Sharapova for 10 years. Seemingly, all signs point to a Williams win. Frankly, I have no argument against it at this point other than to say that in sports anything can happen. 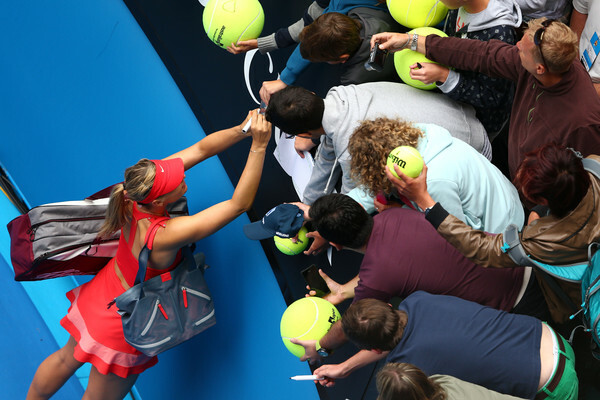 Masha needs to prove she can turn what seems to be an irresistible tide against her. No talk. No moral victories. A win is the only thing that can turn this around. Until Serena clinched her berth in the final, Sharapova still had a mathematical chance at usurping the world #1 ranking. That shows just how close the two are as calculated by a computer. But if Serena extends her decade long win streak against Masha, it will show just how wide the gap between #1 and #2 really is. 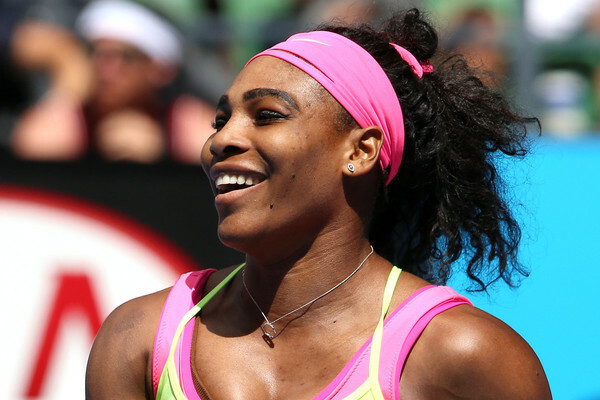 Serena wants Major singles title #19. Sharapova is looking for Major singles title #6. More importantly, Masha needs to win on Saturday if she is to be taken as a serious rival to Serena. 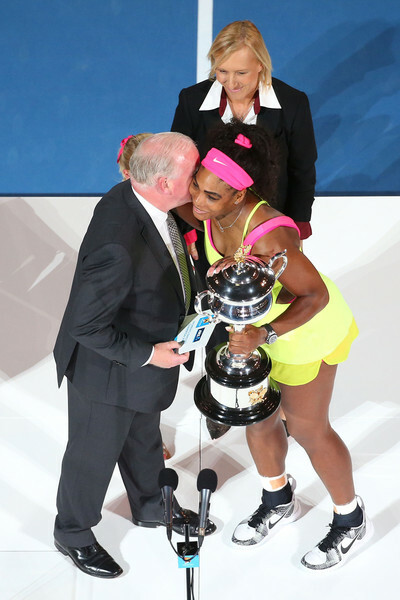 Otherwise, the status quo of Serena on top of the mountain and everybody else still at the base continues unchanged. Sooooo…is it too early to talk Grand Slam? 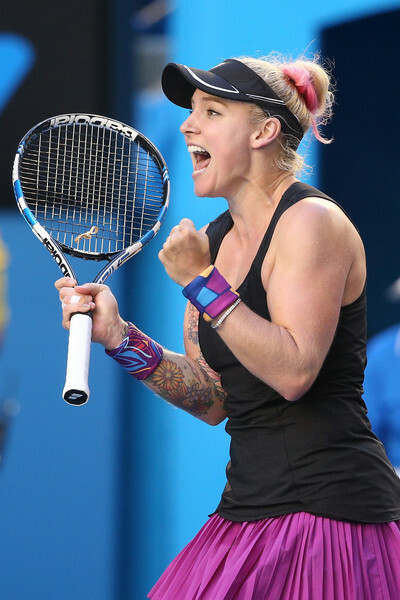 Ok, I realize it’s a long season and lots of things can happen, but after her march to the 2015 Australian Open title, I don’t know who is out there to challenge Serena Williams. Give Maria Sharapova credit for hanging in there and pushing the second set to a tiebreak, but there truly was never the feeling that she was ever in control. In fact, I can make the argument that Madison Keys showed more of a ability to challenge Serena than Masha. Despite a ton of unforced errors in the second set of her semifinals match with Serena, Keys often pushed Serena around with her power in a way I haven’t seen anybody else do in a long time. The problem, as it relates to this year, is that Madison is still developing consistency and her all-around game. She’s probably a year away from really breaking out. 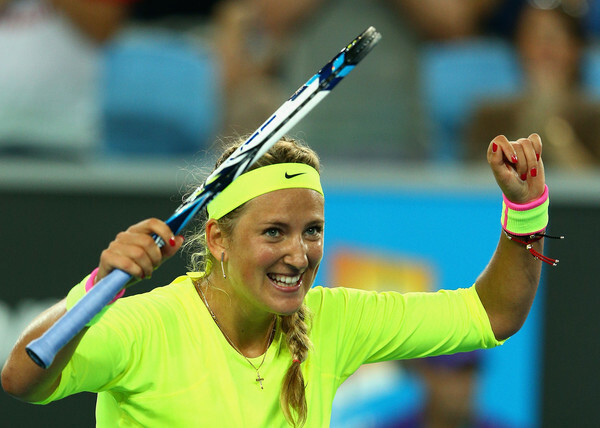 That leaves players like Masha, Victoria Azarenka and Petra Kvitova. Masha is 2-17 against Serena. Vika’s health status (in terms of injuries) is undependable. Petra has the game and talent to be #1, but it seems like I’ve been saying that forever. Simona Halep is a wildcard, but I didn’t like what I saw in her quarterfinal loss to Ekaterina Makarova. I love Halepeno, but she didn’t even try to fight in the second set. That kind of mentality cannot be accepted if she wants to reach #1. Despite Serena beating Sharapova, 6-3 7-6 (5), or for that matter past blowout wins over Sharapova, never can it be said that Masha didn’t fight until the last point. One other wildcard might be Caroline Wozniacki. Serena has won the “Serena Slam” before, all four Majors in a row but not in one calendar year. She can do it again, but this time in one calendar year. If she doesn’t, I wouldn’t be surprised if the player to take her out in a Major is somebody you wouldn’t expect. For example, it wouldn’t surprise me if sombody like Coco Vandeweghe or Lucie Safarova or any number of players outside the top 5 or 6 took out Serena early in an event. Maybe Venus might do it. 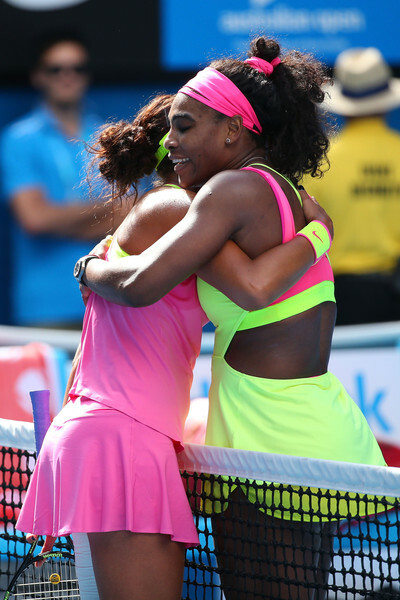 But after watching Serena beat Masha once again, I wonder if this might be an historic year. She’s already captured her 19th singles Major with only Steffi Graf’s 22 Open Era record ahead of her. The non-Open Era record belongs to Margaret Court at 24. Barring injury, I don’t put it past Serena to beat either of those marks. 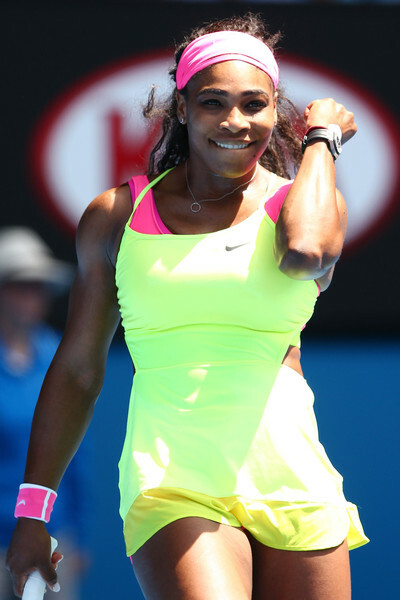 She is so good that a few years ago I stopped talking about Serena in the early rounds. My point of view was that the likelihood is that 80% or more of the events she enters she will probably win. So I can talk about her plenty (as I am doing now) at the end. And if she gets upset early, then I would talk about her then. 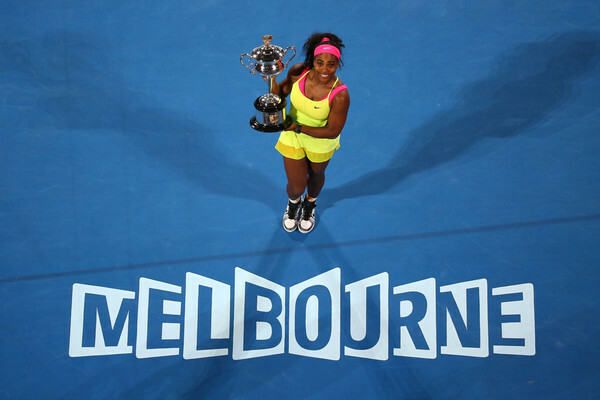 Let’s see: 2014 US Open Champion, 2014 WTA Final Champion, 2015 Australian Open Champion. Seems like that strategy is working. 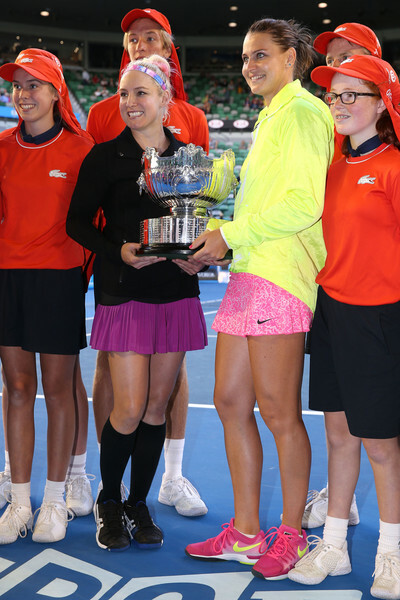 It was really nice to see Bethanie Mattek-Sands team up with Lucie Safarova for the women’s doubles title. 2014 was basically a season marred by injury, culminating in hip surgery. Seeing her have a terrific start to 2015 is wonderful. 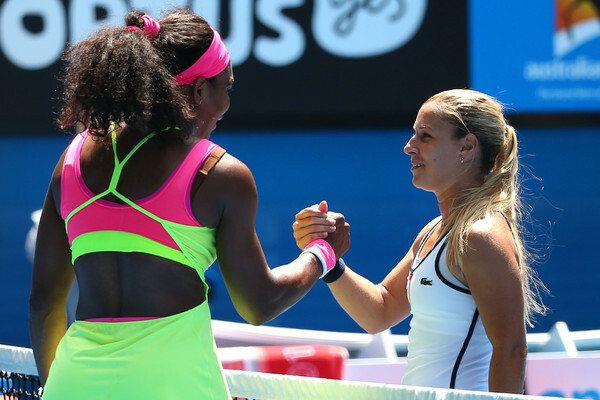 She opened the year with a doubles win at Sydney when she teamed with Sania Mirza. Now to capture her first Major title in women’s doubles, who knows what kind of year it might be. 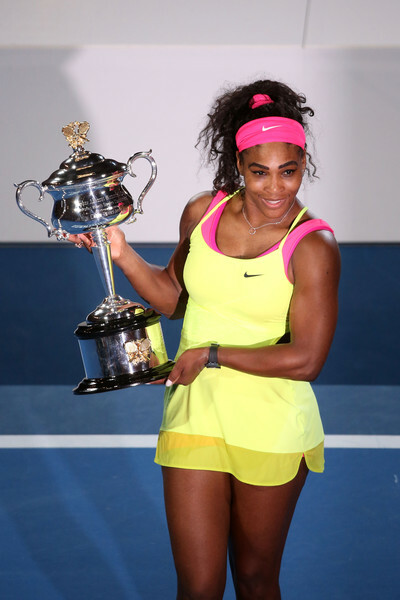 By the way, she did previously have a mixed double Major win at the 2012 Australian Open with Romania’s Horia Tecau. For Lucie Safarova, this is her first Major win of any kind. Although she has 5 WTA singles titles, she plays in the shadow somewhat of countrywoman Petra Kvitova. But don’t underestimate Lucie. She is highly skilled. I know Bethanie has played a lot of doubles with Sania Mirza over the past several years, but I would like to see the Bethanie/Lucie doubles team stay together for awhile to see what more they can accomplish. I think they have the potential to be #1.